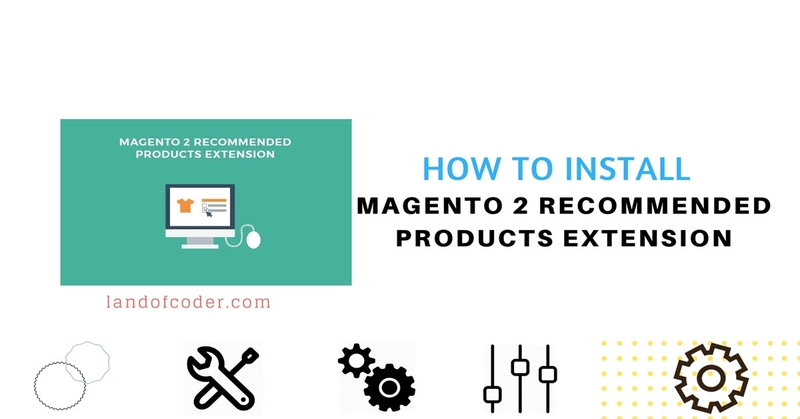 Magento 2 recommended products, a non-disturbance way smoothly drives customers' attention to more products related to the product they are buying. 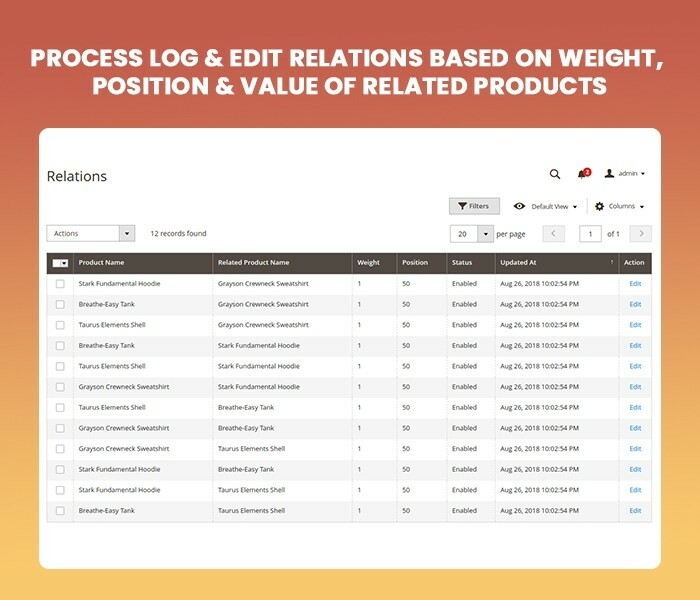 By using an AUTOMATIC and SMART algorithm to estimate the relations between displayed products and related items, related products are updated flexible and will be changed according to customer behaviors and actions. 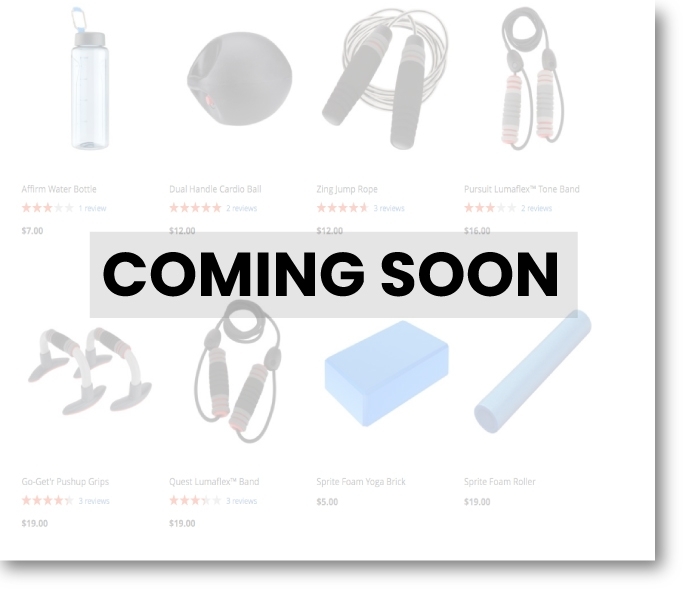 As a result, this module brings amazing shopping experience and perfect solutions to increase sales and cross-sell by motivating the customer to purchase these related products as well. 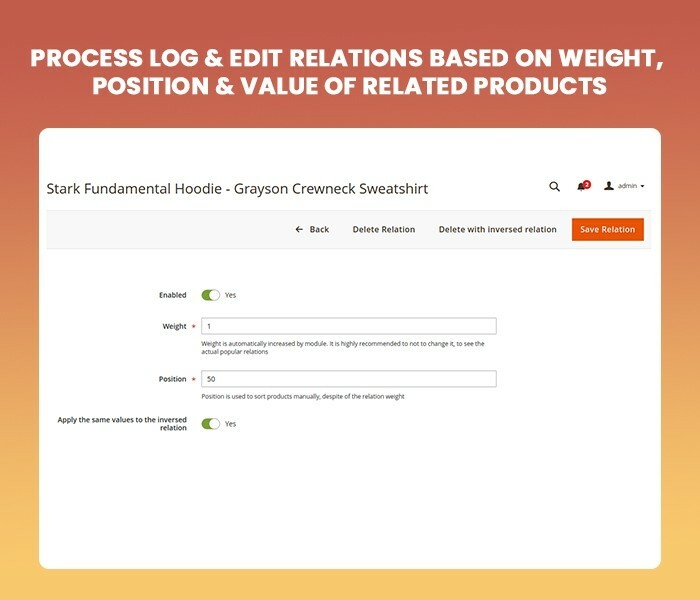 Magento 2 Automatic Related Products extension runs thanks to flexible algorithm set according to customers' behaviors and actions in the backend. 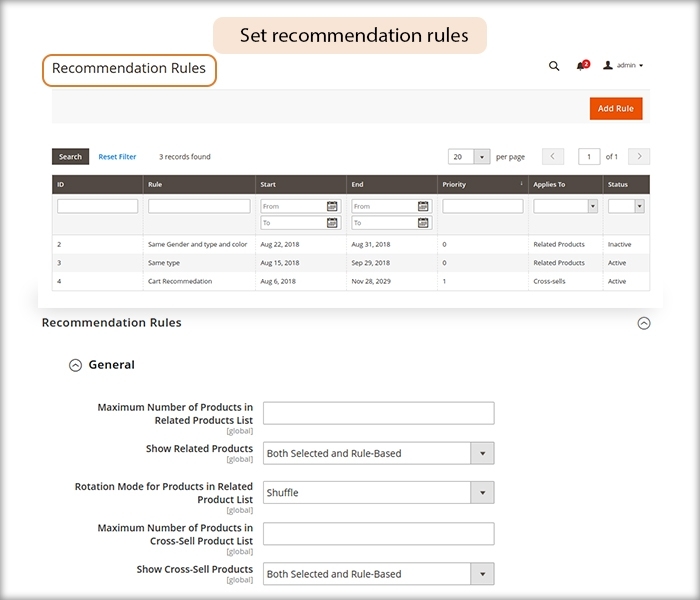 By setting all requirement conditions, any products met requirements will be displayed as a suggestion and easier to catch buyers' interest. 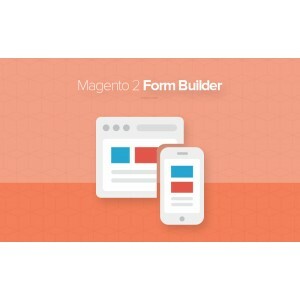 Thereby, BOOST sales, STRENGTHEN conversion rate and SAVE time. 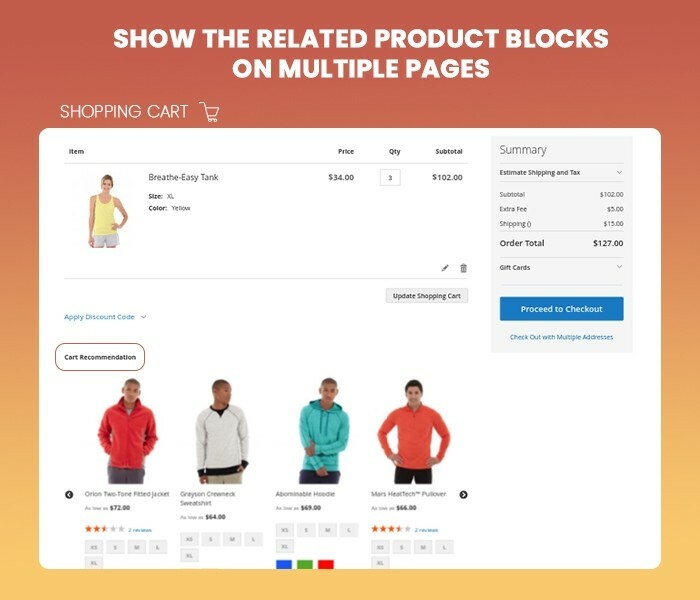 Get more order by presenting related items, Magento 2 recommended product supports sellers to display blocks of related items to suggest customers other product options at any place in your site such as cart page, page category, product page, custom positions etc with the purpose of increasing the number of spontaneous purchases. 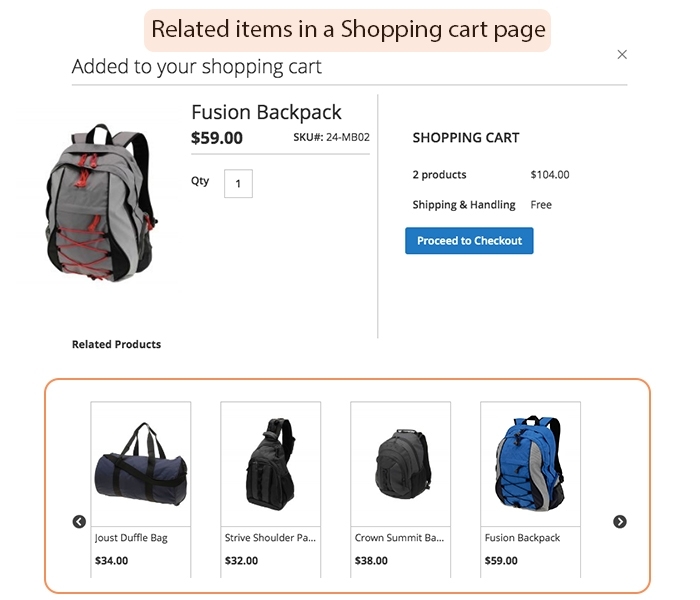 Hence, customers can continue their shopping journey without time-consuming for manually assigning related products. 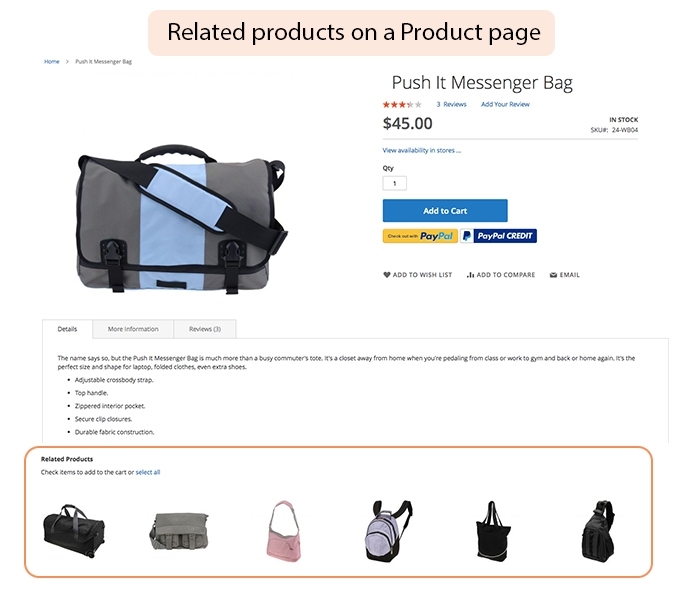 Magento 2 recommended related products allows you to display up-selling and similar items on separate product pages to show various optional choices to your shoppers. 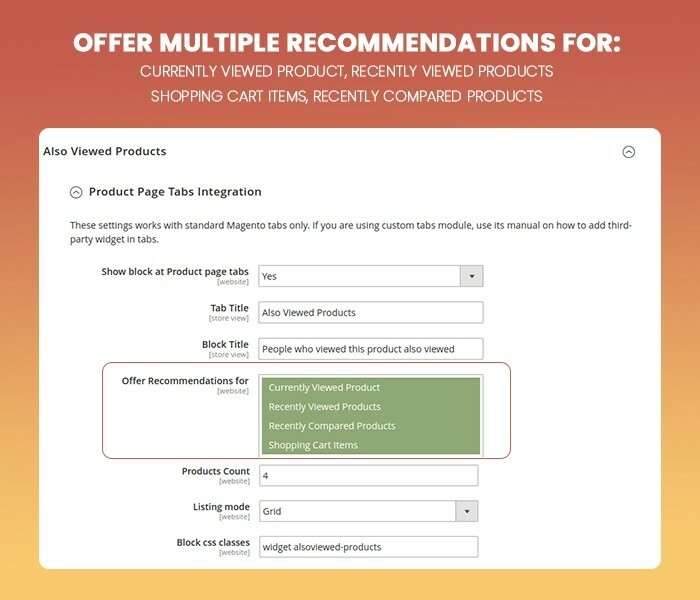 By suggesting similar products with the products they are buying, customers can explore some other potential alternatives matching with their predicted intention and unique taste. 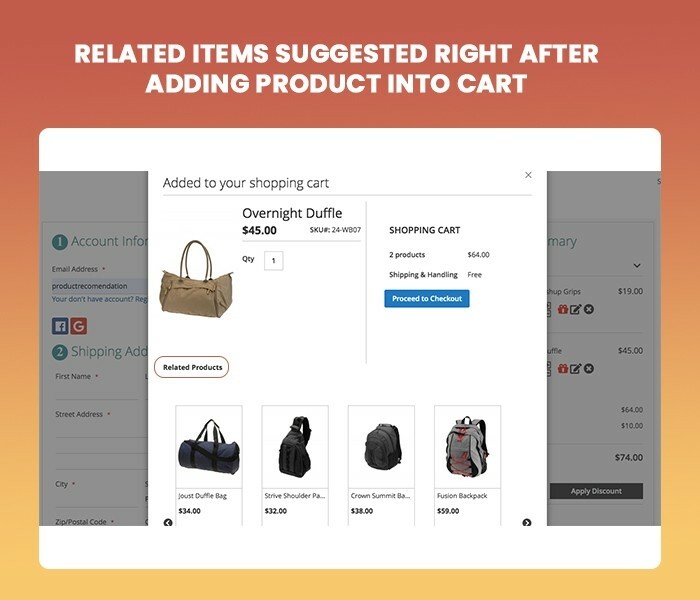 As soon as customers click ‘Add to cart’, the pop-up list of recommendations for related products will appear immediately to suggest relevant items to customers' purchase. 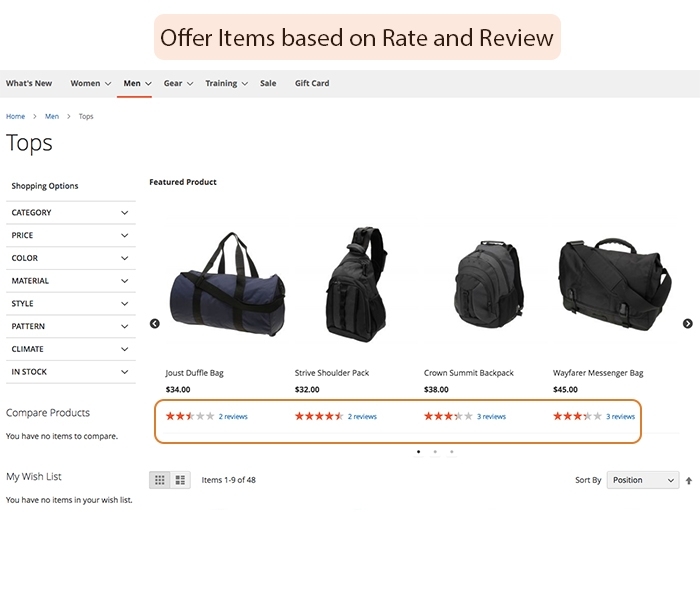 Based on their behavior and actions, Magento 2 recommended products tool can stimulate smartly the demand for other relevant products to promote impulse and spontaneous purchases. 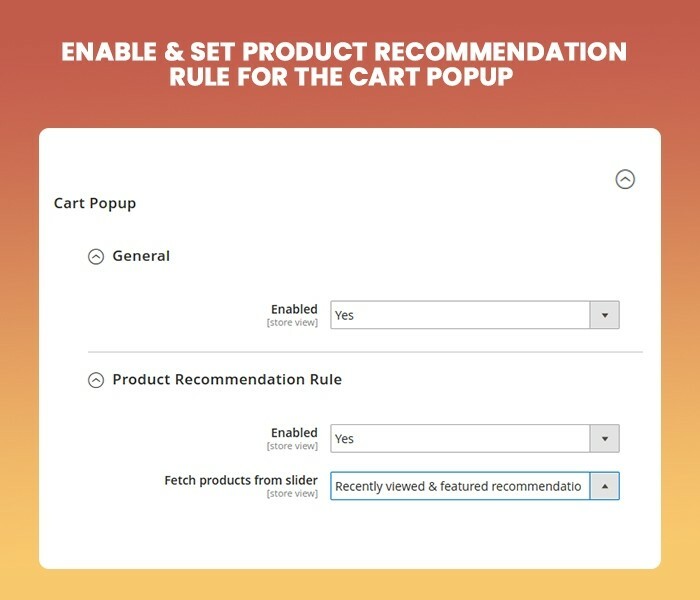 Admin just needs to enable and set the product recommendation rule for the pop-up in the configuration. 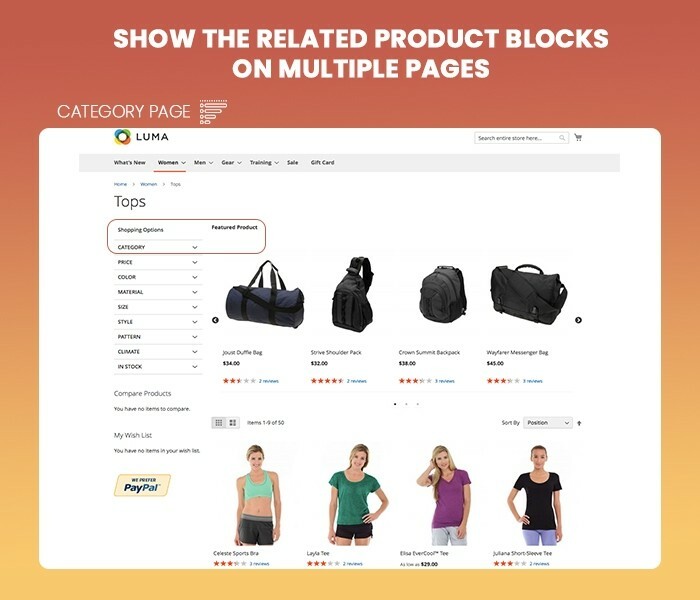 On each product page, you can create additional tabs to offer customers product suggestions such as highly demanded and best-selling products, currently viewed products, recently viewed products, recently compared products and shopping cart items. 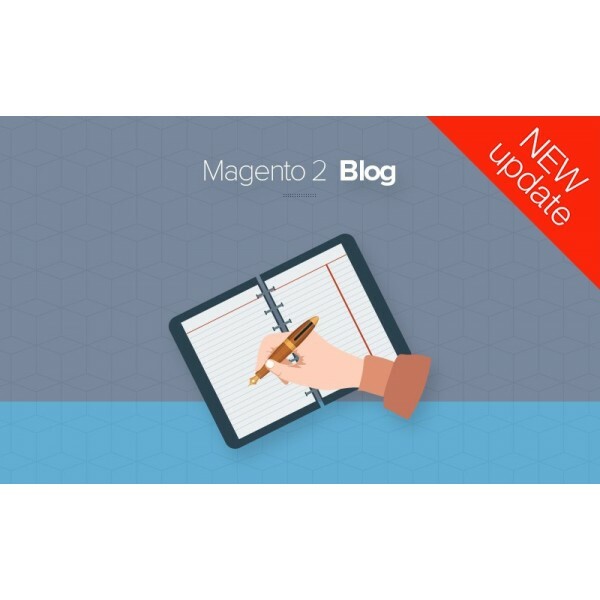 Magento 2 automatic related products satisfy customers' taste, quality and push up conversion rates quickly! 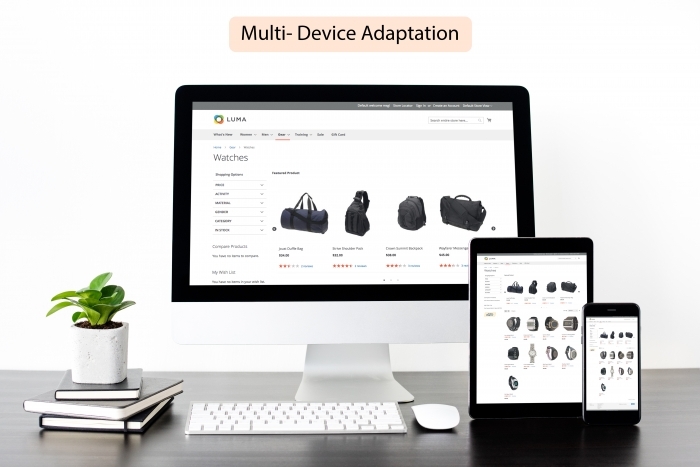 The mobile responsive interface will drive customers to place their orders and push them to click on when satisfying with our products, catch their attention on the similar items spontaneously and get best shopping experiences every time and everywhere they are. 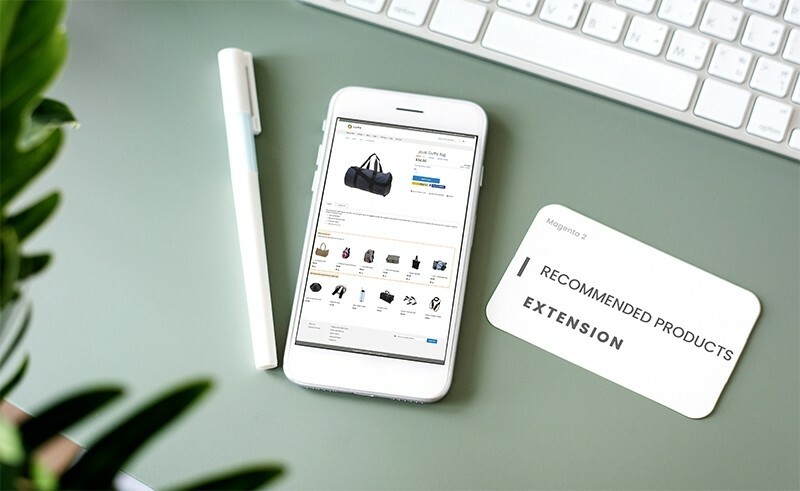 The extension will automatically suggest which products are frequently bought or viewed together with the chosen one and shows relevant results for each quick search of customers. 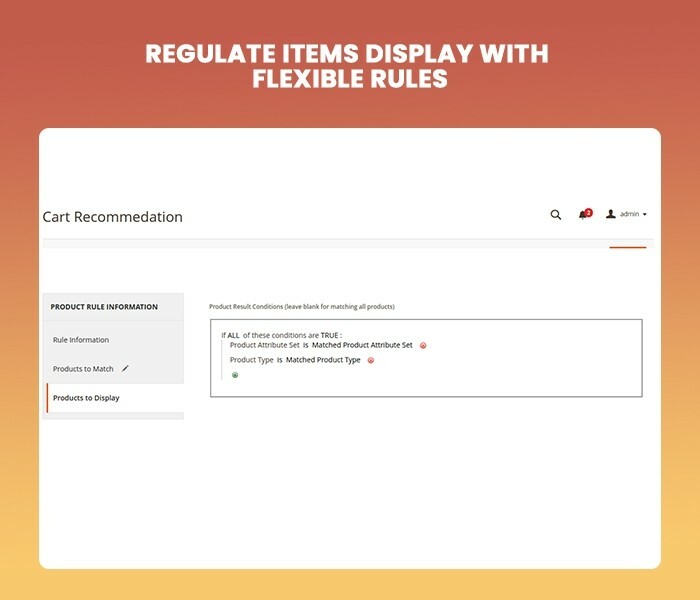 Based on the flexible module settings, admin can edit and change the requirement conditions which decide how to display related products: according to the history of comments, shares, views or purchases. 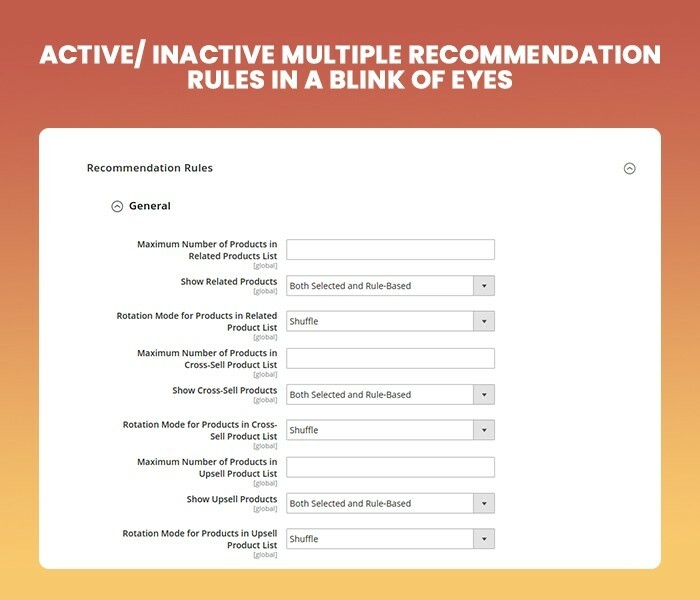 All these conditions setting can be used separately or even combined according to your needs. 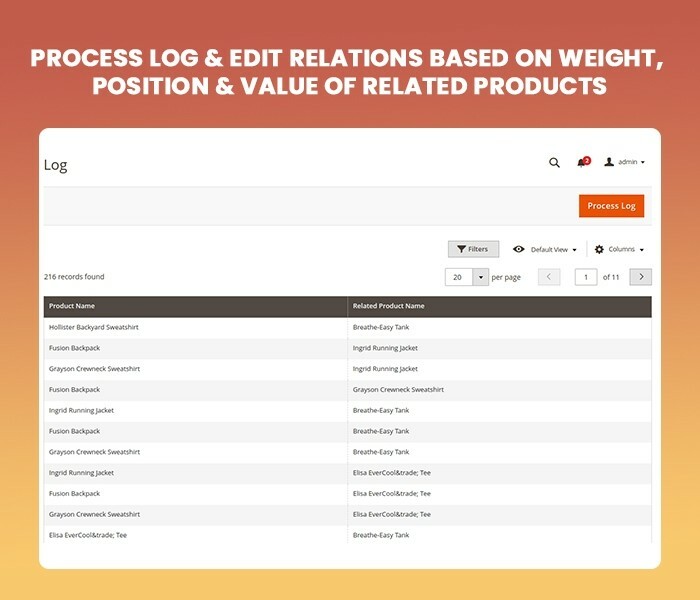 Magento 2 automatic related products allows admin to process log and edit relations based on weight, position and value of related products. 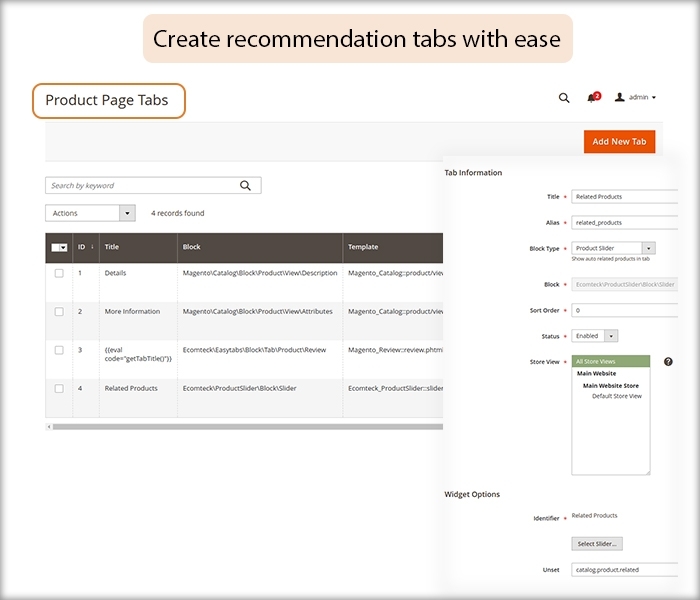 Get full control of admin panel to display recommended products. 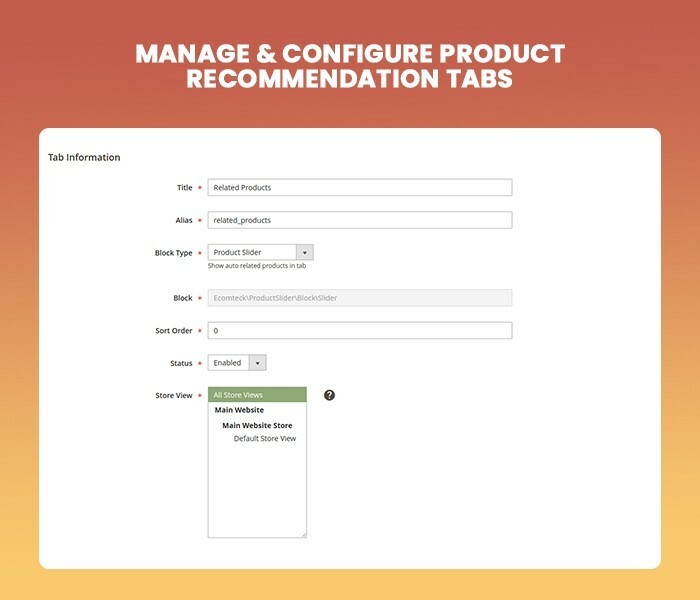 In the admin, you can configure your own product recommendation tabs with details. 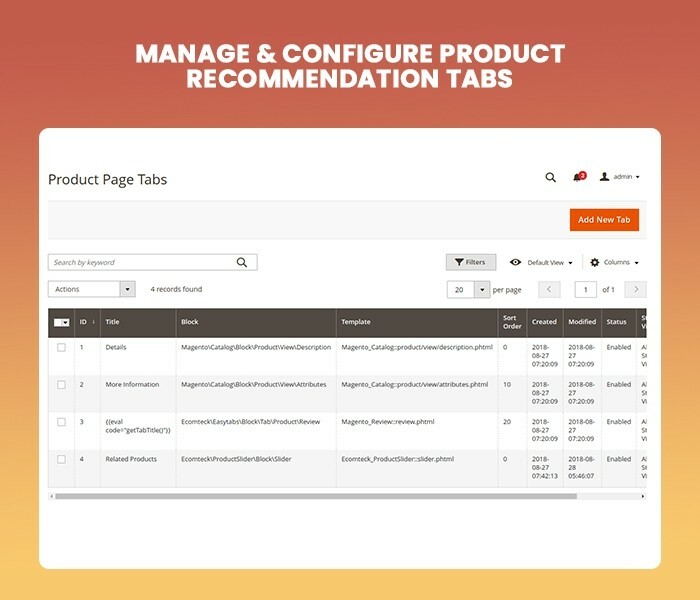 After that, you’re powerful to manage and edit them in ‘Product Page Tabs’. 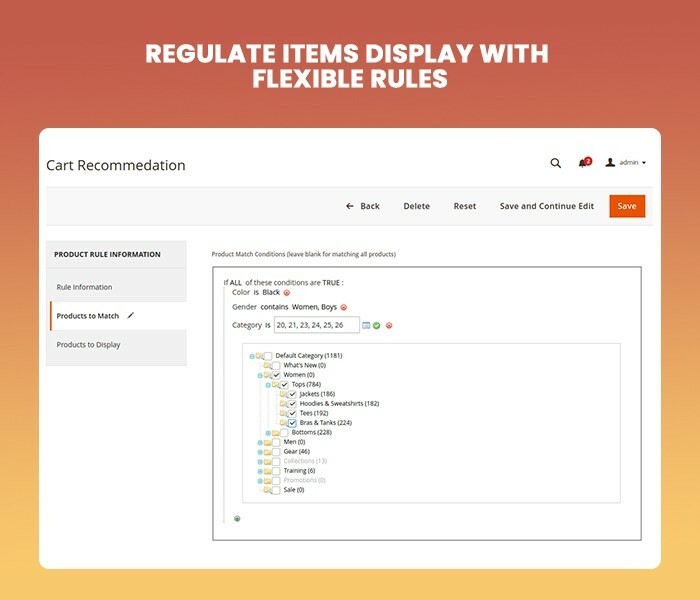 With magento 2 automatic related products, you can configure rules for related products in the backend. 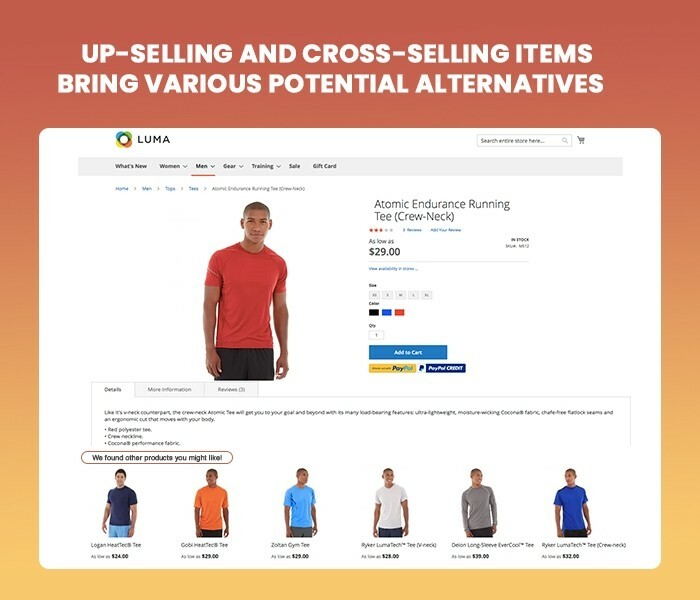 According these conditions, matching items will be displayed depending on the same category, specific brand and different-level price with selected products. 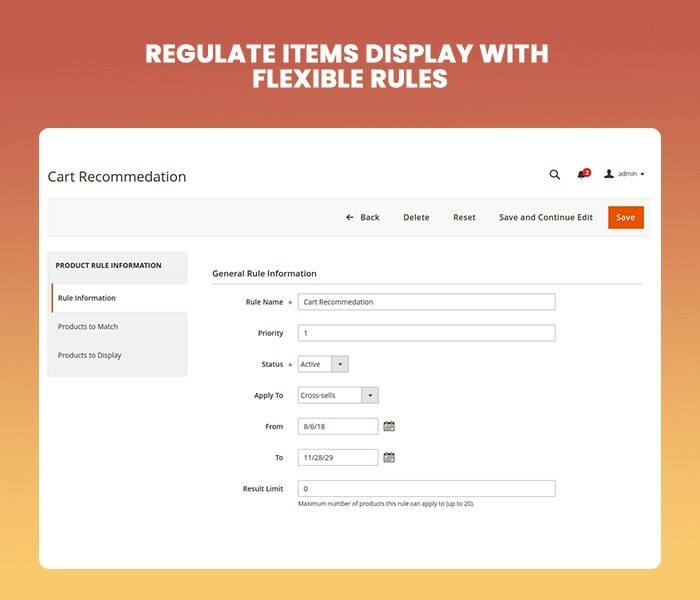 Magento 2 recommended products extension allows you to set cross-selling, up-selling and alternative products to be shown off with rules. 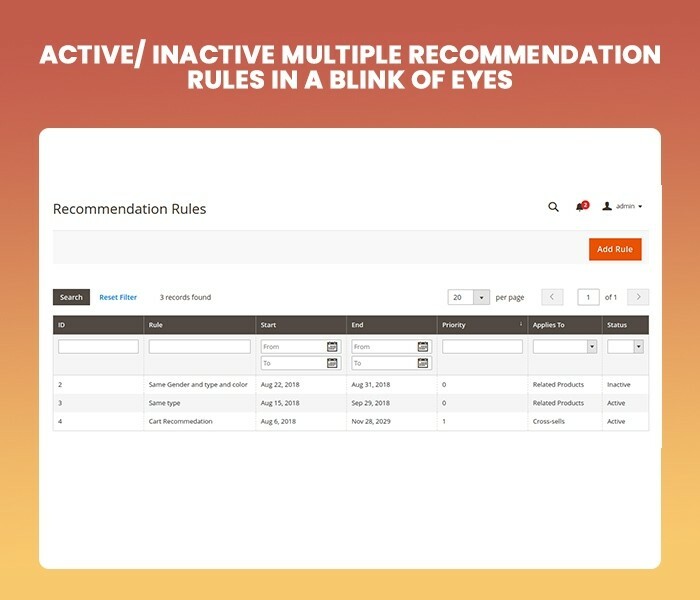 Also, you can active/inactive multiple recommendation rule in a blink of eyes. 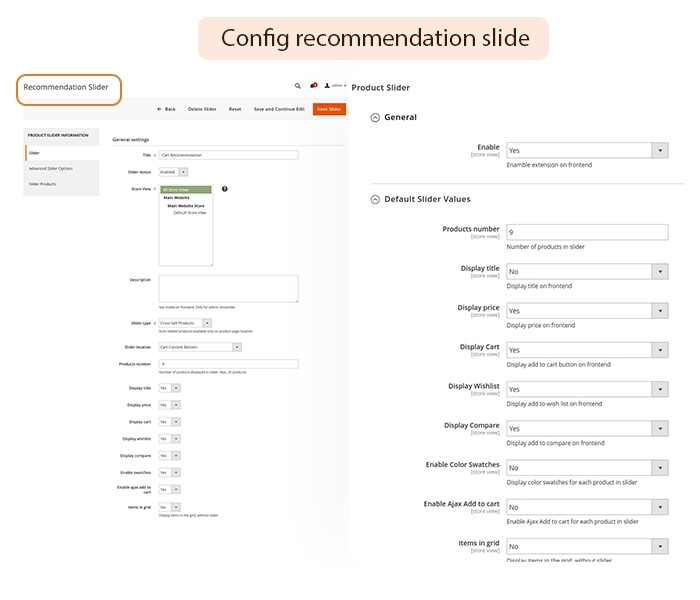 You’re enabled to create unlimited recommendation sliders and configure them with details and options in the backend. 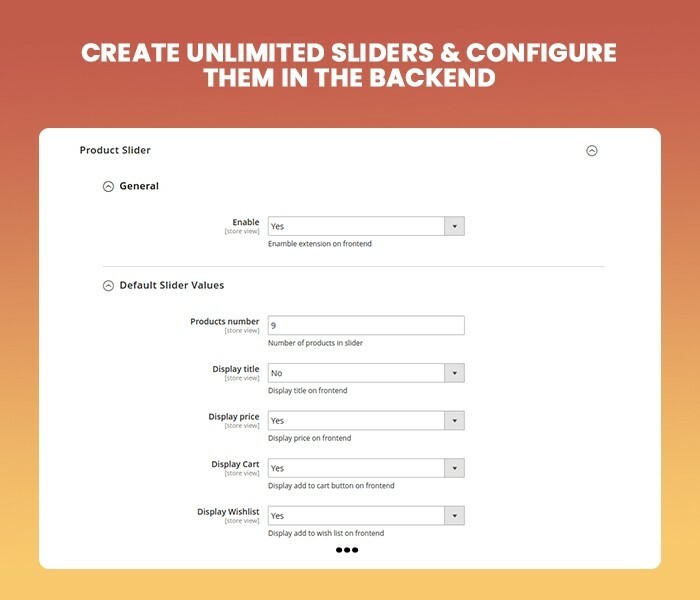 Make your related product sliders display smoothly and work effectively. 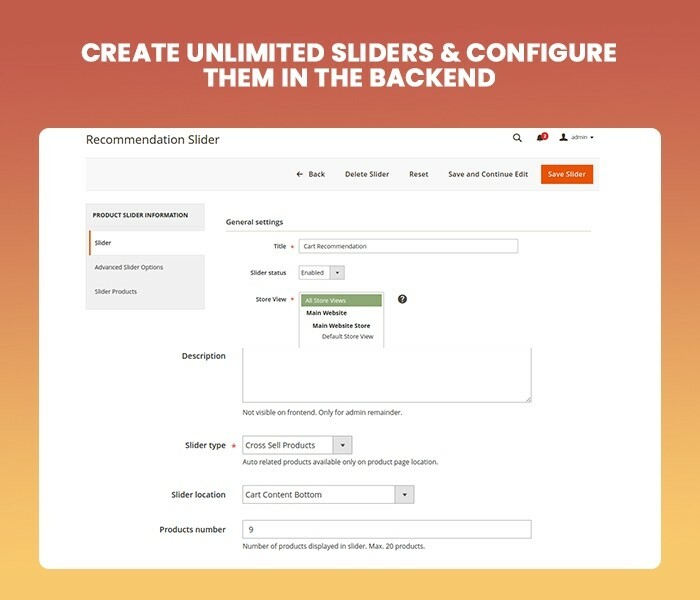 With Magento 2 auto related product extension, you can create many recommendation sliders and edit them as well. 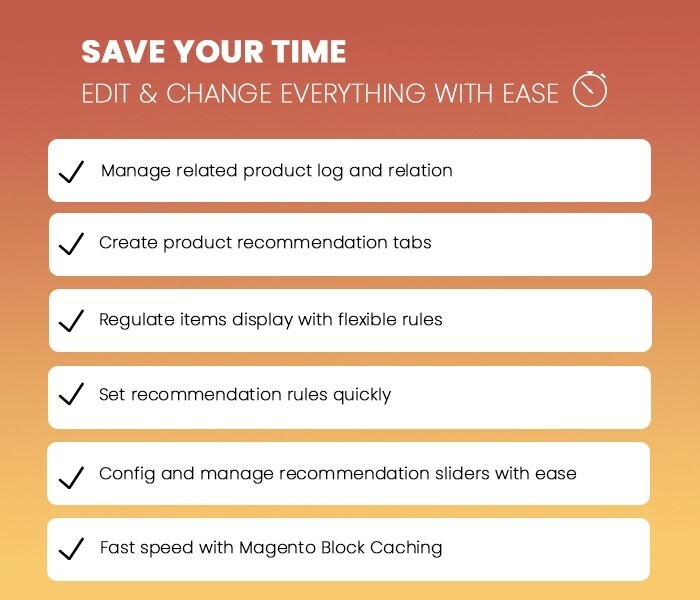 Help you manage everything fast and easily. 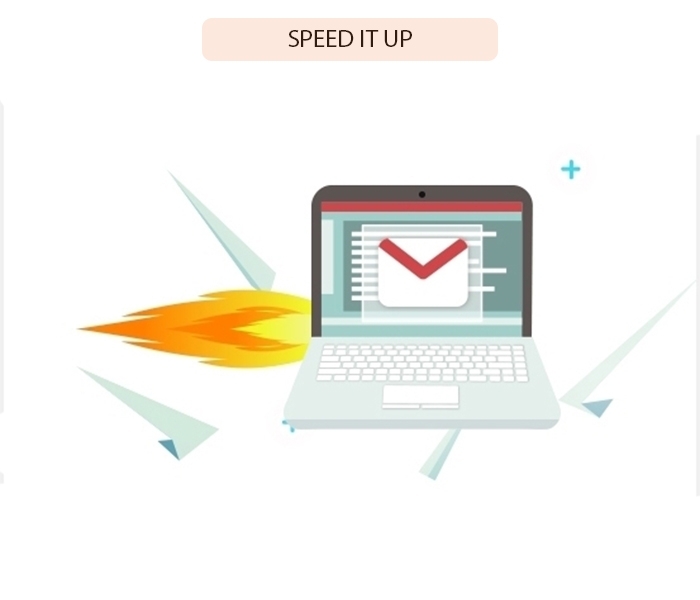 It never slows down your speed. 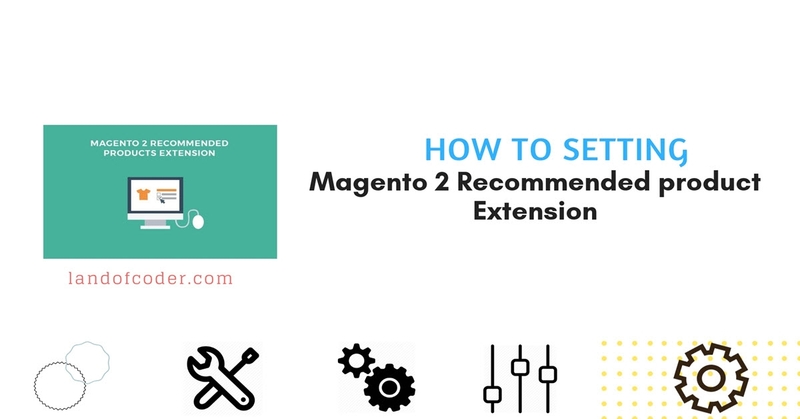 Also, Magento 2 recommended products extension supports Magento block caching that helps to speed up your site significantly. This is a great extension, very easy to install and good customize options. Would highly recommend! 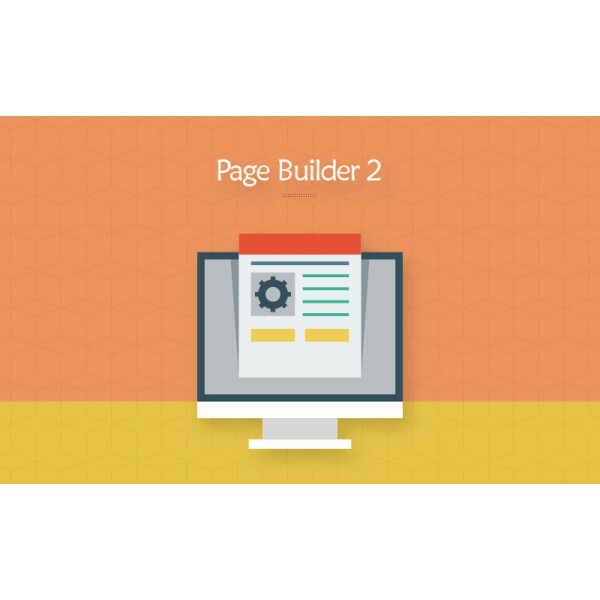 We used this module for our projects. 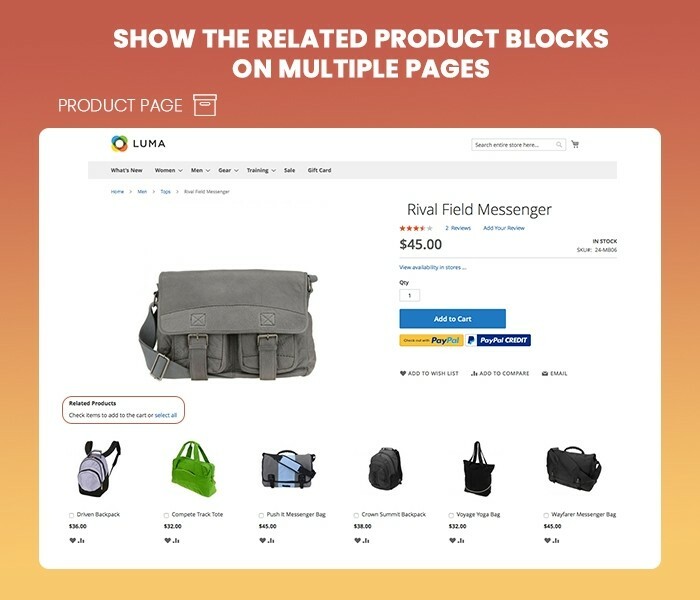 It works great with nice set of features. 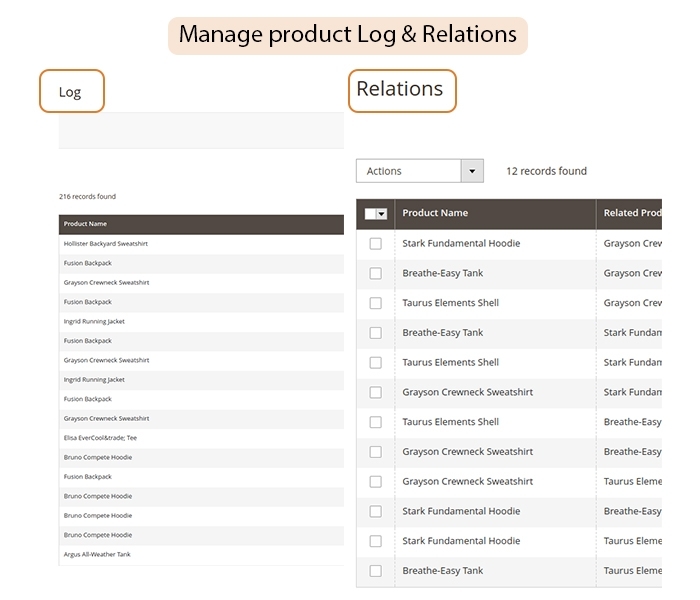 Easy to customize also. 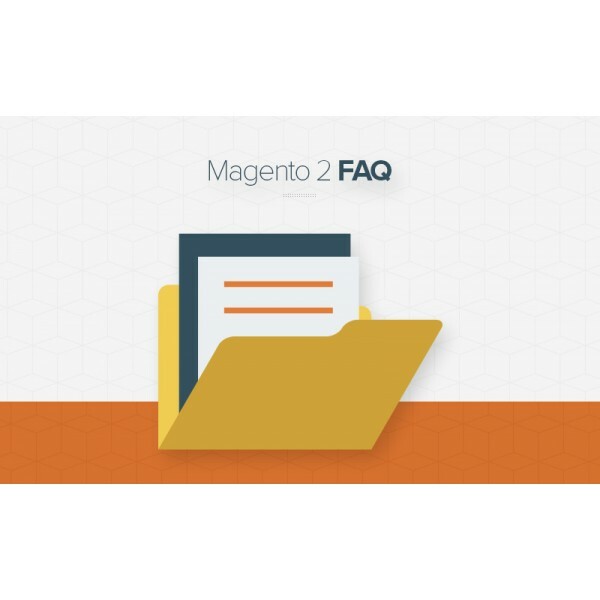 Contacted support few times and your dedicated team helped us a lots. Thanks! Great plugin! 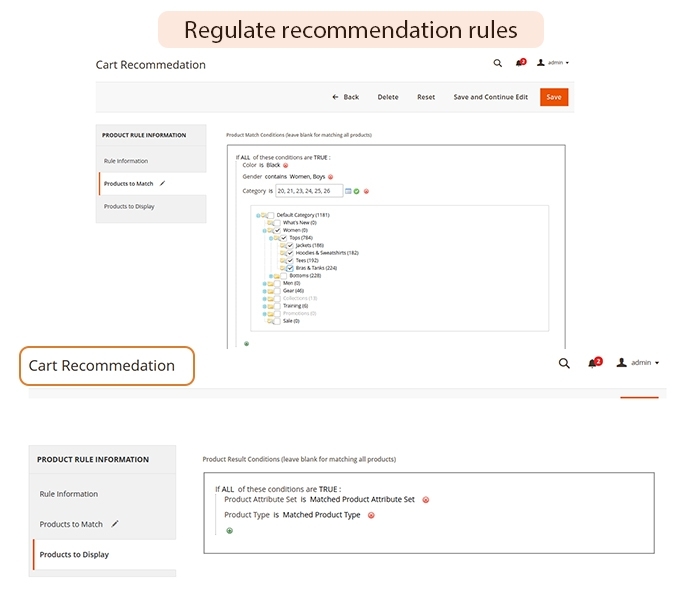 Your support for installation and user guide is appreciated. Thanks! I really like this extension. 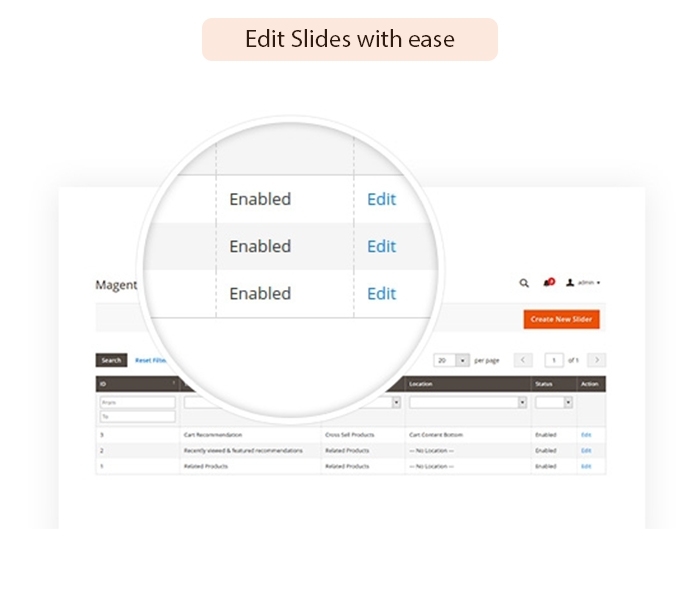 Easy to use and config. 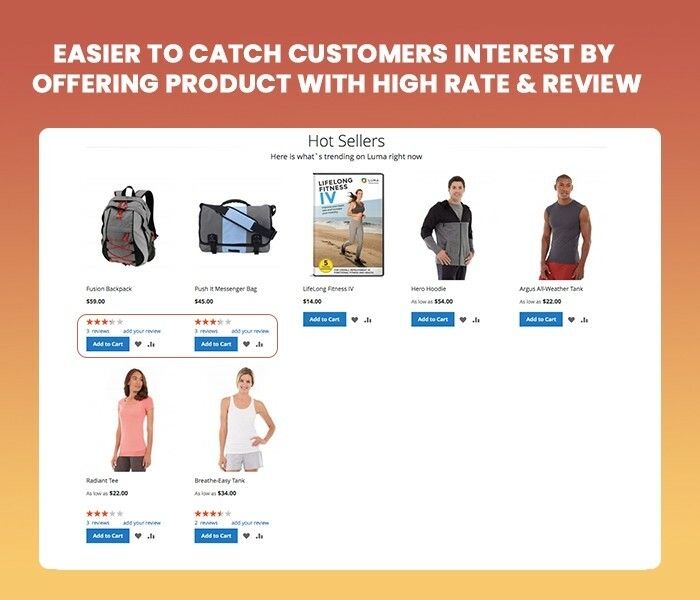 Also helps me boost sales a lots. Keep going! 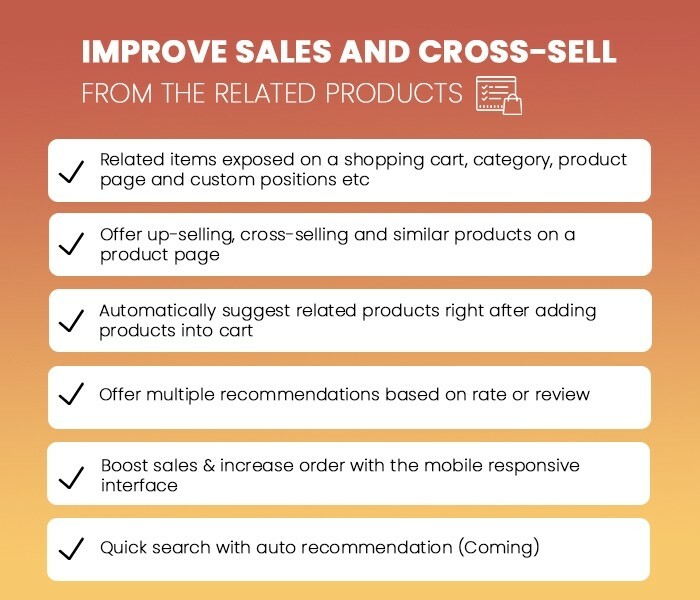 Clearly see increasing sales, especially of related and cross-sell products. And, the support team is dedicated and helpful. 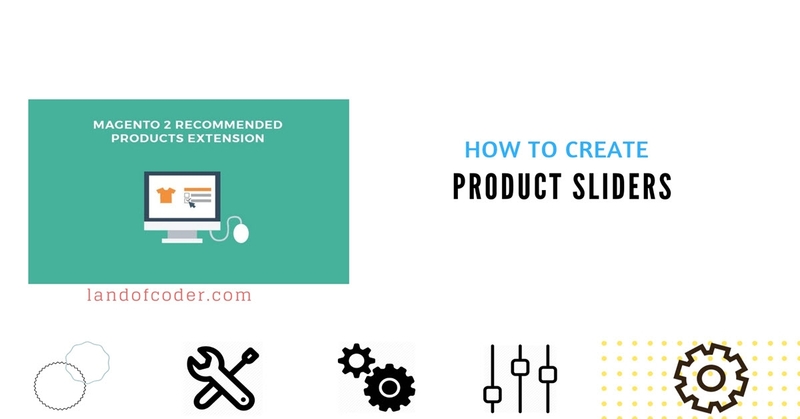 Thanks for this extension, you saved me lots of time. 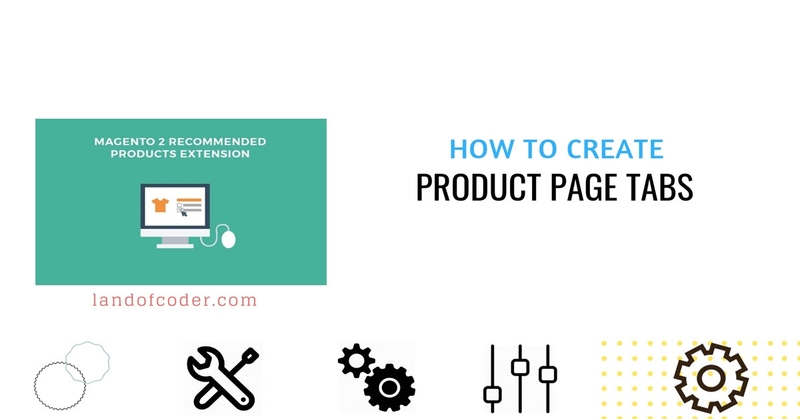 I highly recommend the extension and will suggest it to our friends. Cheer! Great module & dedicated support team! 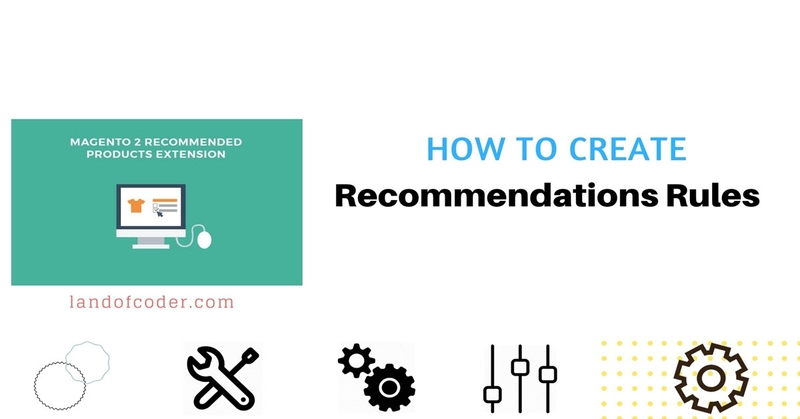 This one is really helpful. 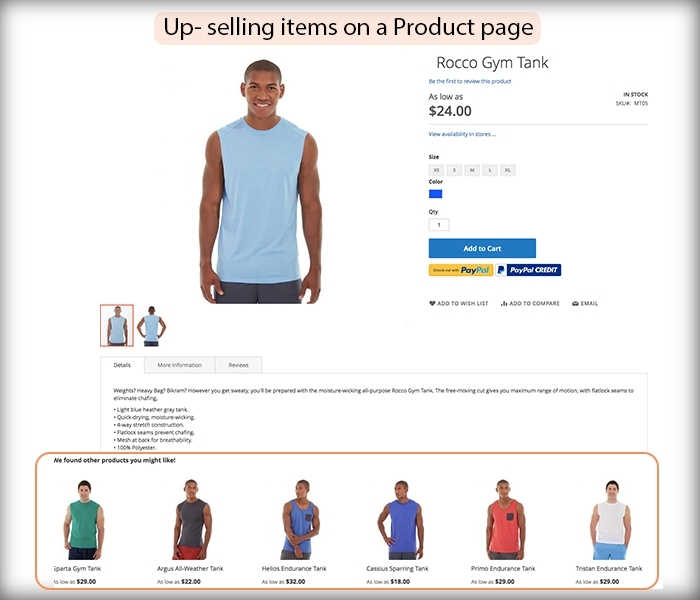 Thanks to this extension, the number of sold products on my online store increases stably. Also, thank you for your immediate support!